So last night Ashley and I hosted our official #hummuschat on Twitter, and it was such a blast! Neither of us really knew what to expect, so we were REALLY pleasantly surprised by the turnout and the frenzied fun that ensued. Thanks to everyone who joined us — we loved discovering that there were people out there who love hummus as much as we do, and who even love to talk about hummus as much as we do. We asked a bunch of hummus-related questions, and everyone shared their hummus experiences with us! 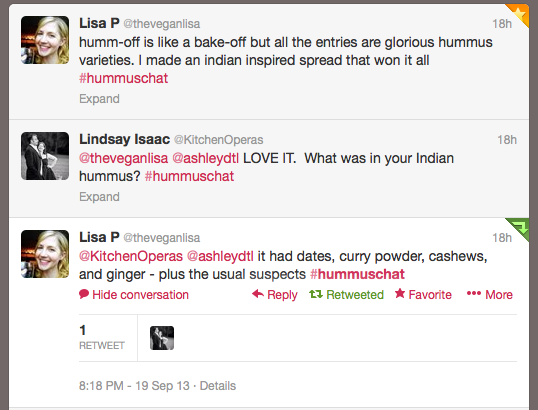 And by the end of the night we even got #hummuschat trending on Twitter!! I think we have run into a hummus problem, where we have only so many more days left in hummus month and sooooooo many more dream hümmi that we’d love to make… we are keeping track of all our hummus wishes on our “all the hummus” board on Pinterest. The main lesson we learned last night? There are more hümmi than we can ever create, but we will keep making (and eating!) hummus in our quest for veg-friendly deliciousness. As Lisa says, “hummus is a food group”. We totally agree. 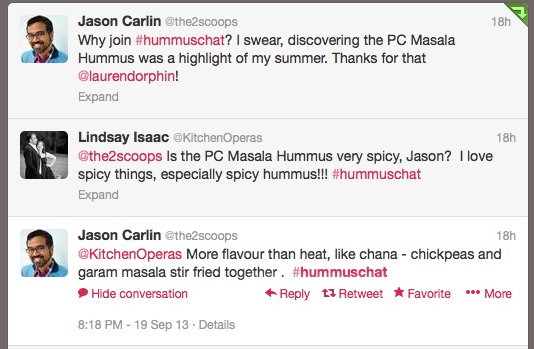 A hummus chat! What a brilliant idea!! I love hummus; when I was at uni I developed a bit of a hummus obsession and had hummus every day for nearly a year!